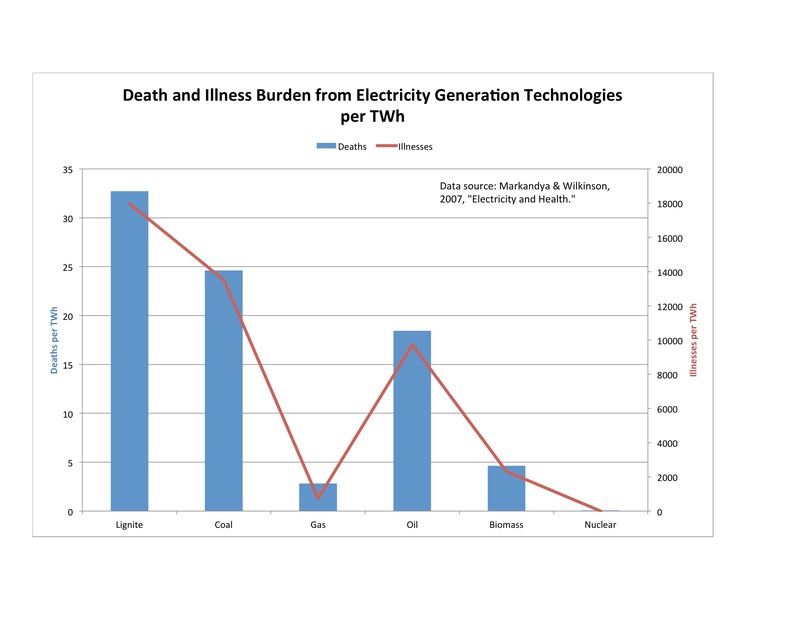 Home » Energy » Least Health Burden from Nuclear Energy? Least Health Burden from Nuclear Energy? One of my favorite sayings is “It ain’t what you don’t know that gets you into trouble. It’s what you know for sure that just ain’t so.” This post is from the department of stuff we know that just ain’t so. A report in Lancet explores the health burden of electricity. The idea is that the technologies used to generate electricity involve construction, operation of complex generating stations, mining, and/or drilling activities, all of which can involve accidents, alter ecosystems, and/or emit air pollution, leading to illness and death among the workers and in the general population. The article seeks to quantify how much. The study compared the health burden of several technologies used to generate electricity in Europe. It found that nuclear energy had a smaller health burden than did lignite, coal, natural gas, oil, and biomass. The graph at right shows the numbers. The blue columns show the number of deaths attributable to each technology. The red line shows the number of serious and minor illnesses from air pollution for each technology. There is at least one reason for caution in considering the results of this article. Deaths and illnesses from nuclear energy can occur in bursts associated with large nuclear disasters. This article was published in 2007. It includes the effects of the Chernobyl disaster (though it is not clear how it accounted for them), but it was published prior to the Fukushima Daiichi nuclear disaster. An updated analysis including Fukushima would need to be included to consider the article comprehensive. Also, the author was not able include a calculation of the health burden of renewable energy sources such as hydro, solar, and wind. While the other generating technologies undoubtedly account for most of the world’s energy, it would be useful to know how these renewable technologies compared. It seems clear that the availability of electricity brings with it clear health advantages compared to pre-electric energy sources. Surprisingly (at least to me), nuclear energy may have carried the least burden so far (pending reanalysis that includes Fukushima Daiichi). I’ve seen the saying quoted above attributed to various creators, including Benjamin Disraeli and Josh Billings. Currently, Wikiquotes attributes it to Mark Twain. Markandya, Anil and Paul Wilkinson. 2007. “Electricity Generation and Health.” Lancet, 370: 979-990. I was able to download this free at http://www.thelancet.com/journals/lancet/article/PIIS0140-6736%2807%2961253-7/fulltext?_eventId=login. By mogreenstats in Energy on 2014/01/23 .